Beefeater, a Pernod Ricard Chivas Brothers brand, has launched a new edition of its cask-rested gin, Beefeater Burrough’s Reserve Edition 2. Crafted by master distiller Desmond Payne following the inaugural release in 2013, the latest expression offers a new twist on the gin-sipping experience through maturation in Bordeaux wine casks. 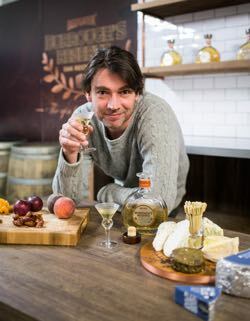 Burrough’s Reserve was launched this week in Madrid in collaboration with British produce supporter and cheese maker Alex James. Beefeater Burrough’s Reserve Edition 2 is a complex gin resulting from a careful production process that sees the classic Beefeater London Dry gin rested in selected red and white Bordeaux wine casks. Released in very small batches, the length of resting is judged by Desmond Payne, the world’s most experienced gin distiller. The process results in an aromatic pale copper gin that showcases the best qualities of both Beefeater gin and fine Bordeaux casks. The second edition follows the launch of Beefeater’s first cask-rested gin in 2013, which used Jean de Lillet casks. The gin is best enjoyed sipped neat, allowing it’s unconventional and unique flavour profile to take centre stage. A series of bespoke sipping cocktails has also been created to elevate the gin’s distinctive character and inspire consumers and bartenders seeking to experiment with the spirit. The launch of Beefeater Burrough’s Reserve Edition 2 also sees the brand colla borating with rock star and award-winning cheese producer Alex James (ppictured left), famed in recent years for his support of British produce and for creating his own range of cheeses at his Cotswolds farm. James and Desmond Payne launched the new gin at exclusive members club ‘Club Del Matador’ in Madrid, alongside a formal dining event that revived the classic ‘savouries’ course – a formerly popular British culinary custom – pairing the new gin with his traditional cheeses. Beefeater Burrough’s Reserve Edition 2 will be available in the UK and Spain from February and rolling out globally from spring, at a 43% ABV and with an RRP of €55 or local equivalent per 70cl bottle.